James William Johnson (born July 16, 1943) is an American football broadcaster and former player, coach, and executive. He served as the head football coach at Oklahoma State University–Stillwater from 1979 to 1983 and the University of Miami from 1984 to 1988. Johnson then moved to the National Football League (NFL), serving as head coach of the Dallas Cowboys from 1989 to 1993, winning two Super Bowls with the team, both against the Buffalo Bills, and the Miami Dolphins from 1996 to 1999. As of 2016, he is an analyst for Fox NFL Sunday, the Fox network's NFL pregame show for the NFL games. Johnson was the first and one of only three football coaches to lead teams to both a major college football championship and a Super Bowl (The others being Barry Switzer and Pete Carroll). Johnson's coaching tree includes a number of future head coaches such as Butch Davis, Norv Turner, Tommy Tuberville, Dave Campo, and Dave Wannstedt. In 1993, Johnson wrote Turning the Thing Around: My Life in Football, ghostwritten by Ed Hinton. Johnson was inducted into the College Football Hall of Fame as a coach in 2012. Born in Port Arthur, Texas, Johnson graduated from Thomas Jefferson High School—renamed Memorial High School—where two of his classmates were future rock icon Janis Joplin and actor G. W. Bailey. Johnson attended college at the University of Arkansas and played on the Arkansas Razorbacks football team, where he was an all-Southwest Conference defensive lineman for coach Frank Broyles and a teammate of future Dallas Cowboys owner Jerry Jones. Other teammates included Ken Hatfield, Jim Lindsey, Ronnie Caveness, and Loyd Phillips. Several future head coaches were assistant coaches for Broyles and the Razorbacks during Johnson's career in Fayetteville: Hayden Fry, Johnny Majors, and Barry Switzer. The 1964 Razorbacks squad went undefeated and was recognized as a national champion by the Football Writers Association of America. Johnson was nicknamed "Jimmy Jumpup" because he never stayed down on the ground for long during football practices or games as it was said his determination was boundless. 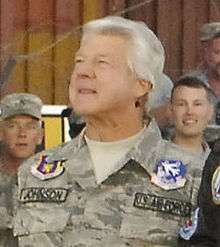 Johnson began as an assistant coach at Louisiana Tech University in 1965. During this time, Phil Robertson of Duck Dynasty fame was the starting quarterback, and Jimmy helped recruit high school quarterback Terry Bradshaw from nearby Shreveport, Louisiana. He then became an assistant coach at Picayune Memorial High School in Picayune, Mississippi, in 1966. In 1967, he was an assistant at Wichita State University, then in 1968 and 1969, he served under Johnny Majors at Iowa State University in Ames. In 1970, he moved on to another Big Eight Conference school to become a defensive line coach at the University of Oklahoma, working under head coach Chuck Fairbanks and alongside future rivals Barry Switzer and Jim Dickey. In 1973, he returned to Arkansas, where he served as defensive coordinator through the 1976 season. There, he coached such players as Brison Manor and Dirt Winston. Johnson had hopes of being named head coach when Broyles retired, but was passed over for Lou Holtz. Holtz offered to retain Johnson on his staff, but Jimmy decided to move on and amicably parted company with his alma mater. Johnson became assistant head coach and defensive coordinator at the University of Pittsburgh under Jackie Sherrill in 1977 and 1978. There, he coached Randy Holloway, David Logan, Al Chesley, J. C. Wilson, and Hugh Green, and was introduced to a Pitt alumnus and assistant coach Dave Wannstedt, who later teamed up with Johnson again at the University of Miami, the Cowboys, and the Dolphins. In 1979, Johnson became head coach at Oklahoma State. Johnson coached for five seasons at Oklahoma State, from 1979 to 1983, before taking the head coaching job at the University of Miami. Johnson interviewed for the head coaching job at Arkansas when Lou Holtz left following the 1983 season, then later found out Ken Hatfield had already been hired. Upset that Frank Broyles (who was still the Arkansas athletic director) made no mention of this during the interview, Jimmy distanced himself from his alma mater. As payback for the snub, a home-and-home series was scheduled with Arkansas. In 1987, Miami gave Arkansas its worst home loss ever at that time, 51-7. In 1979, Jimmy Johnson got his first head coaching job at Oklahoma State University. His tenure there is noteworthy for his successful rebuilding of an inconsistent program. In his final season, he led the Cowboys to an 8–4 record and a 24–14 victory over 20th-ranked Baylor in the Astro-Bluebonnet Bowl. In 1984, when he was offered the head coaching job at Miami, Johnson was unsure if he wanted to leave Stillwater. His good friend Larry Lacewell told Johnson that if he wanted to win a national championship and eventually coach in the NFL, he had to take the Miami job. Johnson soon after accepted the head coaching job at Miami. In 1984, Johnson was hired by the University of Miami to replace former coach Howard Schnellenberger, who had won Miami's first national championship in 1983 and departed for the recently formed United States Football League. Johnson's hiring was met with an initial response of "Jimmy who?" by the fans and media. Johnson started with a shaky 8–5 record his first season, which included a game in which Johnson's Hurricanes blew a 31–0 halftime lead in a loss to Maryland with Frank Reich as its QB, and also included a 47–45 loss to Boston College immortalized by Doug Flutie's "Hail Mary" touchdown pass on the game's final play. But Johnson developed the Hurricanes into a football program that came to be known as "the Decade of Dominance". In his five years at Miami, Johnson compiled a 52–9 record, appeared in five New Year's Day bowl games, winning one national championship (1987) and losing one to the Penn State Nittany Lions (1986). Johnson created a free-wheeling atmosphere where he allowed, and at times encouraged, his players to showboat, trash-talk, and run up the score. He also brought the modern 4-3 defense predicated on athletic upfield linemen to the forefront. The criticism they received from other teams caused the media to deem them the "Bad Boys of College Football", a moniker Johnson openly accepted. Johnson's Hurricanes posted the school's first undefeated regular season in 1986, only to lose the Fiesta Bowl and the national championship to #2-ranked Penn State. The loss, along with losses in Miami's prior two bowl games, began to raise questions about whether Johnson was capable of winning major games. In the ensuing 1987 season, however, the Hurricanes went undefeated in the regular season yet again, and won the school's second national title by defeating Oklahoma for the third season in a row. Johnson also created controversy by allowing the University of Miami to retire Vinny Testaverde's football jersey number #14, but refusing to retire Bernie Kosar's number #20, though Kosar played one season for Johnson and led the Hurricanes to the national title (though that did not come under Johnson). Johnson's reason for not retiring Kosar's number was, "Bernie didn't finish the program here (at Miami)." Kosar graduated with honors a year ahead of his freshman class in 1985 with a dual major in finance and economics (and subsequently entered the NFL's supplemental draft). Testaverde won the school's first Heisman Trophy award in December 1986, and was the first player selected in the 1987 NFL Draft. However, Johnson reached out and signed Bernie Kosar, who was thrown out by the Cleveland Browns during the 1993 NFL season, to be the Cowboys back-up to Troy Aikman, playing during the Cowboys 1993 Super Bowl run and clinched the NFC Championship game, earning a Super Bowl ring with Jimmy Johnson. Johnson was inducted into the University of Miami Sports Hall of Fame in 1996. In May 2012, Johnson was inducted into the College Football Hall of Fame. In 1989, Jerry Jones, the new owner of the National Football League's Dallas Cowboys, a long-time friend and former University of Arkansas teammate of Johnson's, asked him to be the new head coach, replacing Tom Landry, who had coached the team since its beginning in 1960. Johnson was reunited with former Miami standout Michael Irvin, and in Johnson's first season as coach, the 1989 Cowboys went 1–15. Johnson, however, did not take long to develop the Cowboys into a championship-quality team. Johnson had an ability to find talent in the draft, make savvy trades (namely, the trade of Herschel Walker, which yielded six high draft picks and a number of players from the Minnesota Vikings), and by signing quality players as free agents in the age before the NFL had imposed a salary cap, such as Jay Novacek. Johnson served as head coach of the Cowboys from 1989 through 1993. He is one of only six men in NFL history (including Vince Lombardi, Don Shula, Chuck Noll, Mike Shanahan, and Bill Belichick) to coach consecutive Super Bowl winners, winning Super Bowl XXVII in 1992 and Super Bowl XXVIII in 1993, (his team beat the Buffalo Bills in both Super Bowls). Johnson led the Cowboys to a record of 10-1 in the regular season during the month of December from 1991 to 1993, also leading to a playoff record of 7-1 in those years. Johnson also had a record of 24-1 when running back Emmitt Smith ran for 100 yards or more in a regular-season game, and 5-0 in the postseason, setting the culture for winning and keeping the lead in those years from 1990 to 1993, winning two Super Bowls. Jimmy Johnson and Jerry Jones mutually agreed to split due largely to their inability to work together. Johnson's relationship with Jones began to fall apart in 1993. It started with Jones wanting more say in player personnel decisions. Johnson had sole control over all football decisions and refused to give it up. In March 1993, right after the Cowboys had won their first Super Bowl under Johnson, Jones told the media that any coach could have led the Cowboys to a Super Bowl. This infuriated Johnson. Another incident happened in December 1993, when the Cowboys were getting ready to play the Giants for the NFC East title. Johnson had said he would be interested in the Jacksonville Jaguars' head coaching position. This led to Jones telling the media that he alone would decide Johnson's coaching future. They agreed to part on March 28, 1994, after the Cowboys had won their second straight Super Bowl, with Johnson getting a $2 million bonus. To this day, Johnson is not on the Dallas Cowboys "Ring of Honor". When asked in the summer of 2014 why Johnson was not in the ring of honor despite his two Super Bowl victories as coach of the Cowboys, Jones stated: "Disloyalty ... I couldn't handle the disloyalty." After working as a TV analyst with Fox Sports for two years and briefly flirting with an offer for the head-coaching job of the Philadelphia Eagles in 1994, Johnson joined the Miami Dolphins in 1996, replacing legendary head coach Don Shula, who retired at the end of the 1995 season. After a below-expectations year for the Dolphins in 1995, capped off by a blowout loss in the playoffs versus the Buffalo Bills, there was a groundswell among Dolphins fans who wanted Shula to step aside in favor of Johnson. Johnson's tenure in Miami did not live up to expectations. Johnson won fewer games in his first season than Shula had in his final season (8–8 vs. 9–7). Johnson's overall winning percentage at Miami was 55.3% vs. 65.8% for Shula. Johnson inherited one of the NFL's best offenses, led by Hall of Fame quarterback Dan Marino; the defense was considered mediocre, though it was ranked 10th in fewest points allowed in 1995. As a defensive specialist, Johnson expected to put together a championship defense. With complete control over personnel decisions, Johnson and his staff signed several excellent defensive players, drafting future pro bowlers Zach Thomas, Jason Taylor, Sam Madison, and Patrick Surtain. But Johnson's brilliant draft record was blemished by several disappointments, including fifth-round pick running back Cecil Collins, and two first-round picks, running back John Avery and wide receiver Yatil Green. The Dolphins finished 8-8 in 1996 and then 9-7 in 1997, losing to the New England Patriots in the wildcard playoff round. In 1998, the Dolphins finished 10-6 with the league's best defense, defeated the Buffalo Bills in the wildcard playoffs, then were crushed 38-3 by the Denver Broncos in the divisional round. In January 1999, Johnson resigned as Dolphins head coach, citing burnout. He reversed his decision in one day, after Dan Marino—with whom Johnson had a strained relationship—pleaded with Johnson to come back. Dolphins owner Wayne Huizenga also hired the recently fired Chicago Bears head coach Dave Wannstedt, a former assistant under Johnson both at the University of Miami and in Dallas, as defensive coordinator/assistant head coach. In the face of Super Bowl–level expectations, Miami faded down the stretch, and Johnson's relationship with Marino dissolved completely. The Dolphins still finished the season 9-7 and won in the wildcard round of the playoffs, but in the divisional they were crushed in an embarrassing 62–7 loss to the Jacksonville Jaguars. Johnson resigned the day after the game and Marino soon thereafter announced his retirement. Johnson was succeeded by Dave Wannstedt. After leaving the Dolphins, Johnson became a TV studio analyst again for Fox Sports, and is currently an on-air staff member on Fox NFL Sunday. He has been assigned as a studio analyst for Fox's coverage of the Bowl Championship Series in January with Chris Rose as the host, and also pens a column on Foxsports.com. In addition he has made several guest or cameo appearances in film and television: as a bearded prisoner in lockup on the television series The Shield, as a guest star in the episode, "Johnsonwreckers" on Coach in 1994, and in the movie The Waterboy next to Bill Cowher. Johnson endorsements include Procter & Gamble, and a series of commercials for the male enhancement pill ExtenZe in 2010. He was also involved in a South Florida-based scam called The Leading Edge that purported to feature businesses on an "educational" "interstitial" program by that name that would air on public television. Johnson filmed the TV spots, in the style of an infomercial, and businesses were pitched on the program using these clips, which appeared on the website. They were charged an "underwriting fee" of over $20,000 to appear on the show, however, the show never actually would then air. They were not affiliated with PBS and there is no record of any air dates. Johnson was one of 20 castaways competing in Survivor: Nicaragua, the 21st edition of Survivor, in late 2010. He is a long-time fan of the show, and had been cast for Survivor: Gabon, but had to withdraw after failing a physical. Johnson, the oldest contestant of the season, was part of the Espada tribe, made up entirely of people aged 40 and older. He was voted out 8–1 on Day Eight of the competition, becoming the third person voted out of the game and finishing 18th overall. As he left the game, he said to his tribe, "One of you, win your million bucks, okay?" He also said, "I had fun, but I was miserable the whole time. I still love the game, it's been a great adventure, but this is the most stressful time I've ever gone through in my life. And that includes Super Bowls and collegiate national championships. I initially said, 'Keep your strongest members.' I obviously wasn't one of them." Johnson was married to Linda Kay Cooper on July 12, 1963, with whom he has two sons. They divorced in January 1990. On July 18, 1999, Johnson married Rhonda Rookmaaker. As of 2010, he lives in Islamorada in the Florida Keys. Johnson owns a restaurant named Three Rings after the three championships he's won on collegiate and professional levels, located in Miami, Florida. He previously owned a second restaurant under the same name in Oklahoma City, Oklahoma; however, it has since closed. Johnson's fishing boat, which is docked behind his oceanfront home in Islamorada, Florida, is also called "Three Rings". He also owns a bar and restaurant in Key Largo, Florida called "JJ's Big Chill" located at mile marker 104. 11 5 0 .688 2nd in NFC East 1 1 .500 Lost to Detroit Lions in NFC Divisional Game. 13 3 0 .813 1st in NFC East 3 0 1.000 Super Bowl XXVII champions. 12 4 0 .750 1st in NFC East 3 0 1.000 Super Bowl XXVIII champions. 9 7 0 .563 2nd in AFC East 0 1 .000 Lost to New England Patriots in AFC Wild-Card Game. 10 6 0 .625 2nd in AFC East 1 1 .500 Lost to Denver Broncos in AFC Divisional Game. 9 7 0 .563 3rd in AFC East 1 1 .500 Lost to Jacksonville Jaguars in AFC Divisional Game. ↑ "Johnson Staying in TV". The New York Times. December 17, 1994. Retrieved December 18, 2010. ↑ "UNNECESSARY ROUGHNESS". The Times. January 15, 1996. Retrieved December 18, 2010. ↑ "HALL OF FAMERS DON SHULA". Retrieved December 18, 2010. ↑ "Uneasy rests the alliance of Johnson, Marino". The Sporting News. December 22, 1997. Retrieved December 18, 2010. ↑ Five Questions With Jimmy Johnson Archived October 22, 2009, at the Wayback Machine. ↑ Snyder, Whitney (February 5, 2010). "Jimmy Johnson, ExtenZe Spokesman! Coach To Pitch 'Male Enhancement' Pills". Huffington Post. ↑ "Former Dallas Cowboys coach Jimmy Johnson to be a contestant on 'Survivor: Nicaragua'". The Dallas Morning News. July 21, 2010. Retrieved December 18, 2010. ↑ "Survivor: Nicaragua's Old vs. Young Cast Revealed!". Yahoo!. August 9, 2010. Retrieved December 18, 2010. ↑ "Survivor: Nicaragua - Episode 3". CBS.